Paul Ryan’s speech in Tampa revealed him to be much more of an attack dog than policy wonk. Paul Ryan was supposed to be the idea man. So far he’s pure attack dog. 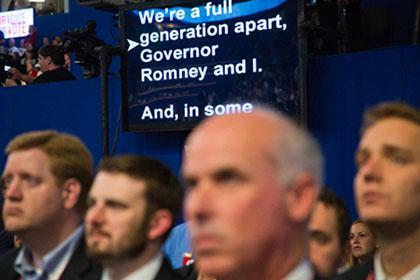 The teleprompter for Ryan’s speech. Paul Ryan is supposed to be a wonk, but we’ve never really seen this side of him since he’s become a vice presidential candidate. So far he has been an articulate Republican Party spokesperson for all of Barack Obama’s failings. He hit his rhetorical height Wednesday night at the Republican convention when he unbuckled a long and stinging critique of the Obama administration and the Democratic Party. It was powerful, well received, and passionately delivered. The speech didn’t require policy expertise, particularly. Indeed, an expert might feel compelled to avoid the series of inconsistencies and contradictions that were woven through Ryan’s jeremiad. Ryan boasted in his speech that he wanted to have a big policy debate, but there’s also been no evidence that the Romney/Ryan campaign really wants to have a debate if that means anything other than a rag session on Obama. This is a direct contradiction of the Ryan political model for governing. In 2006, when President George Bush tried to sell a plan for Social Security private accounts, Ryan told his colleagues it was an idea they could run on. Not many did. In later elections, Ryan made the same case. Be specific about revolutionary change and it will serve you politically. That’s not the way Ryan is behaving now. The timid promotion of the ideas he supposedly stands for suggests that either Ryan never believed in his original theory or Mitt Romney doesn’t believe in it. I’d love to see Paul Ryan explain how the premium support plan works, how he arrived at the formula for increasing the voucher-like payment, and why he thinks that amount is the right one. He could explain the economic reasoning behind why Mitt Romney thinks the free market will reduce Medicare costs, maintain quality and not cause a reduction in benefits. What studies makes them think this? He might point to the example of Medicare Part D’s savings to give the theoretical underpinnings for Romney’s larger theory of savings. Does that mean that the conservatives who were against the part D expansion were wrong? Let Paul be a wonk or let’s stop calling him one. When Ryan uses his policy expertise to make his case against the president it is effective politics. When he plays with the numbers, elides his own role in budget failures, and only tells half the story, he is acting like a politician. Right now he is definitely filling the role of the vice presidential attack dog. But he might also be undermining the trust the campaign has been asking for from voters. Trust Mitt, Ann Romney said last night. When he’s doing bold things you know he’ll be fair and that he has a good heart. But if the idea man on the ticket only uses his skills for bare-knuckled attacks and disingenuous sales pitches, why should voters trust that he won’t do the same thing once Romney is in office?